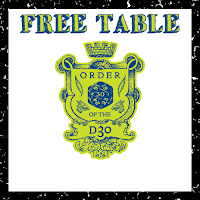 I've put up this month's d30 table and it is a continuation of alternate treasure generation tables. This month it is a random sculpture table that was made with OSR games in mind. A lot of OSR games don't really have art pieces as part of their treasure tables, so the values for these sculpture pieces were created so theses sculpture pieces could be subbed in for gems, which every OSR game I've seen has. The pieces generated with this table are vaguely specific, which I know is an oxymoron. Your first d30 roll will be used to determine the general type of sculpture and the subject matter, but the GM will have to fill in the blank some. For example, if you rolled a "22", the result would be a high-relief carving of a monster. The GM would determine what the monster was....hopefully that explains "vaguely specific" enough. My Patrons over at Patreon received this table when it was completed back in March. 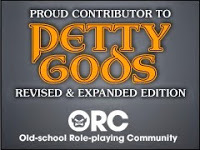 If you want to be ahead of the release curve and get some things earlier and other things with a few more options (like larger sized maps), you might want to consider becoming a Patron. To go to the appropriate DTRPG product page, click on either graphic in this post or use this link.